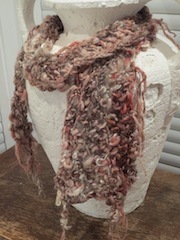 I have had so much fun working on some new scarf designs. I am completely in love with asymmetrical clothing. So, I decided to design an asymmetrical scarf. Wow, do I ever love them. These scarves come to almost a point on one end and are approximately 6-8 inches on the other end. The versatility of this scarf is amazing. 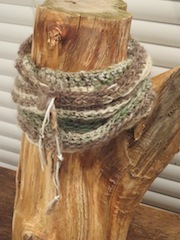 One could wear it as a long scarf or wrap it up as a lovely soft cowl. Another new design that I am very excited about is the convertable cowl. 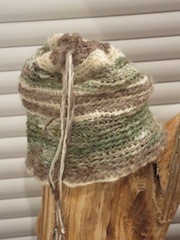 This is a cute little cowl that converts into a hat by pulling on a drawstring on one end.